Do you have a dog for a pet? Do you think your dog is smart and special? Does your dog do funny or unusual things? 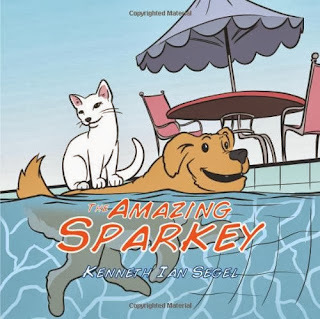 This story is about Sparkey who is an amazing, wonder dog. Sparkey, dearly loved by his family, is truly unique. He could do arithmetic - both addition and subtraction. He could sing with his ears flapping in rhythm. He could "talk" entering into family conversations with strange sounds and an occasional bark. He could read. He would bring the daily newspaper into the house, open the paper, place his nose on the print and move his head from line to line. At times, he would laugh out loud as he read. At other times, it sounded as if he was crying when he read something sad. Sparkey enjoyed shopping for groceries in a supermarket. He would paw at those items he wanted the family to take home. He liked sports, particularly swimming. He would jump into the family's backyard pool and speed from one end to the other. Very proud of himself, he would clap his paws in approval of his achievement. Mysterious and strange things were happening in the Kelly home. No one in the family could explain the unusual happenings. It was weird. Was it the work of ghosts? Was it leprechauns? What was really going on? Things disappeared and reappeared. There were no clues. Working together as detectives, and with Sparkey's help, the Kelly family finally solved the mystery. Sparkey proved that he really was a wonder dog. Have you seen the show Martha Speaks? This book reminds me of that show with the dog who can do wondrous things. Sparkey can't actually 'talk' but he is able to do a lot of unique things. When the mysterious things start happening I figure it is Sparkey. Though he does help remedy things in the end, I am not sure if it was him or not. This part was a little confusing to me. The Family comes together to solve the crime, which I like this family unity. I just didn't understand why Sparkey would do these things and need more attention if he is a wonder dog already. And if he didn't do it, then who did? And if it was Sparkey, why was it funny rather than annoying to the family to have all of these things going on. I was confused. What I did get out of the book was the family pulling together to investigate, that they each took a piece of the puzzle and then they came back as a team and reported. The illustrations by Amory Abbott were wonderful. I think they really added to the story. The facial expressions on the family were drawn wonderfully. Kenneth Ian Segel is an ordained Rabbi of the Hebrew Union College in Cincinnati, Ohio, and has served major congregations in the United States and Canada. For over 30 years, the author has creatively taught and passionately motivated children. His sincere love and respect for children and special skill in communicating with humor and sensitivity have delighted children's audiences throughout the country. The book sounds cute but confusing. I wonder what my grandson would take from it. At first, I thought he would love it. A dog that would do his math homework...! He loves animals and enjoyed Martha Speaks. It will be interesting to see how it is received by the kids, but I do like the family aspect of it.